With a little tweaking, Richard Marson’s tell-all biography of the late John Nathan-Turner could easily replace its subtitle with that of Peter Hook’s wonderful memoir on the Manchester club scene of the 1980s, The Hacienda: How Not to Run a Club, as its subject’s tenure as producer of Doctor Who reads like a case study on how not to run a television series. Of greatest interest to Who fans will likely be the vast range of commentary Marson culled from program insiders, especially the insights from actors, directors, and writers of the classic series. Some of the heavy hitters include Peter Davison, Colin Baker, and Sylvester McCoy, who played Doctors five through seven, along with the actors who played companions Ace, Peri, Mel, Tegan, Turlough, and Adric (Sophie Aldred, Nicola Bryant, Bonnie Langford, Janet Fielding, Mark Strickson, and Matthew Waterhouse respectively). What emerges over the course of nearly 400 pages is a portrait of an ambitious, flawed, and ultimately tragic figure whose insecurities both fueled his success and led to his downfall. The consensus, as far as Marson and those interviewed for the book are concerned, is that J N-T (as the producer was known) excelled at the art of spectacle. As soon as he took over as producer, he commissioned new titles for the show and an arguably catchier (for the times) version of the show’s trademark theme music. He’s also responsible for giving the Doctor a “uniform,” most noticeable in the question marks that started showing up in the Doctor’s costume during Tom Baker’s last season in the titular role. Along similar lines, the producer also did all he could to keep both the show and himself in the spotlight, including grabbing headlines by giving the Doctor new companions on a fairly regular basis and making himself a celebrity in his own right. One of N-T’s favorite poses involved pointing a finger in the face of any celebrity he was being photographed with, a move that insured he could never be cropped out of the picture. 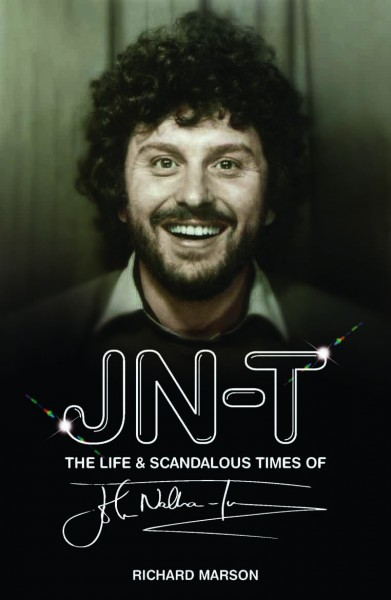 J N-T’s intense focus on the marketing of his show, however, came at the expense of paying attention to its writing, and the book is full of commentary from writers, directors, and script editors who express frustration at the lack of direction they received under the producer’s tenure. Indeed, even as N-T pursued headlines and press coverage from British tabloids and Doctor Who fan magazines alike, the fans grew increasingly displeased with his work as producer and, at least in Great Britain, voiced their displeasure through the very channels N-T used to promote the show. The result was increasing paranoia on N-T’s part, a situation that wasn’t helped by the BBC’s waning interest in the show. Tellingly, it turns out the BBC Enterprises (roughly speaking, the merchandising arm of the BBC, now known as BBC Worldwide) kept funneling money to the show to keep it in production even as ratings started to slip. Though fewer viewers were watching the show, sales of TARDIS key chains and toy sonic screwdrivers were bringing in plenty of cash — a lesson, Marson is quick to point out, not lost on contemporary producers of the program. Indeed, when one considers the plethora of Doctor Who toys currently on the market, there’s an argument to be made for the idea that the Doctor Who program exists at least partially to promote sales of Doctor Who merchandise and ensure the longevity of the Doctor Who brand. In terms of style, Marson adopts a journalistic tone throughout much of his book but also offers his own opinions and analyses where warranted. A chapter on N-T’s sexual exploits and exploitations (title “Hanky Panky”) comes off as somewhat sensationalistic but is balanced out by the rest of the book. Despite his flaws — and they were apparently numerous — J N-T emerges from J N-T as a sympathetic figure whose desire for love and acceptance in all of their forms led to great heights and, tragically, greater lows.